Yesterday marked eight years of this site. One year ago, there was cake, and I was thinking a lot about writing. When I brought up the same subject recently, it wasn't intentional. In fact, I didn't make the connection. Maybe it is that the time around anniversaries encourage the taking of stock. I'm thankful for the tendency, as I am thankful for the generous comments and letters from many of you that followed that mention, sharing personal experiences of trying to put thoughts into words, or your own processes from a variety of creative disciplines. I feel lucky to have been part of the dialogue. If you don't mind, it's a thread I'd like to continue. It begins with a reoccurring analogy: on the road. Right around this time two years ago, a windstorm hit where we live. That morning I had a meeting out of town. I planned to leave early, and because I would be away for the day, my boys were going to spend it with my parents at their house. I remember standing in the driveway, waiting to kiss Sean goodbye while he buckled in the lads to take them there, when I heard the wind blowing high in the trees. It was a sustained howl. I looked up and saw clouds moving with such speed that I said something to Sean about it; for whatever reason, neither of us were concerned, and neither of us checked the weather report. At the time, nobody seemed to grasp how bad the day would become. Even when I did turn on the radio, there was a warning to take things slow, but no real sense of urgency. Traffic was heavy. Street signs and billboards bowed and rattled. My hand cramped from keeping a firm grip on the wheel. I made it to my meeting on time. I turned off my phone. I wasn't aware of it then, but I'd driven out of the path of the storm. What seemed only gloomy, but not wholly memorable where I was, brought 100-kilometre-per-hour gusts at home. It knocked out power, knocked off siding, and blew roofs clean away. It could have been much worse that in was. We were fortunate. By the time I tried to head back, the storm was over. The winds had stopped and the once-troubled sky was now a clear, bright, and almost surreal blue. Nonetheless, the bridge that arches over the bay was still closed. There was a lineup of cars inching forward, jostling for position, as four lanes were reduced to three, then two, then one. Police cars with flashing lights directed us through the supports of that bridge, to cross the water on a much smaller one. Past that place, the highway itself was barricaded. The service roads and side roads were packed. There were detours marked, but with all the scattered debris, it wasn't long before you were redirected by a downed power line, or a tree snapped like a twig or, in one case, an overturned, life-sized, ornamental elephant. There is a landmark near our house that's visible from quite far away. Three-and-a-half hours into a drive that usually takes 90 minutes, I caught sight of it for the first time. As I made my progress in lurching zigzags across the backroads in between me and that beacon, it would blink in and out of my view. I'd get a glimpse as I crested a hill, only to lose it again as I dipped into a valley or the road turned away. There was no specific logic or wisdom to the route I chose; with no insights into which course was clear, I simply did my best to keep myself aimed at where I knew I wanted to end up. It took more than five hours to get there. For me, writing is often that drive. You see, I'm not a great planner. I can't lay out a itinerary of introduction, thesis, support and conclusion, and hit all the points, neat and tidy with time to spare. I will have an idea of where I need to finish, and there are occasions when I'll take the scenic route. Usually, however, the distance from the beginning and end is a winding one. There are false starts. And misdirection. And turning back. I stretch, wander, and push the boundaries of the map. I get another map because the old one was covered in scribbles and ripped in places, and I couldn't seem to fold it right. Then I'll fill that map with so many scribbles that I'll need a new pen. It's good to keep a stack of maps. I'm not above asking for directions; there's wisdom to be learned from who have travelled here before and from those who are still part of the caravan. They'll give you a lift when your tank runs dry. What's more, a travelling companion can calm the nerves caused by a motor that clatters and sputters with every jolting mile, or the stomach-churning feeling that you're in a neighbourhood you don't recognize. It's nauseous mix of terror tinged with exhilarating curiousity. You might want to sip some ginger ale. Guides and company can only get you so far. Much of the mechanics of writing is hidden, isolating work. That's when the sun is gone and darkness sets in. Bring snacks. Scour the landscape for sign posts — those points upon which the whole adventure pivots, the phrases that stick out of the scenery like an upside-down cement pachyderm. I'm telling you, keep an eye out for those markers. They get you through. With them, you might find a different approach. Follow their directions, even when the passage seems too narrow, when you're filled with paralyzing doubt and can't remember why you wanted to take this trip in the first place, and it's quite certain that the pavement will crumble under your wheels. Don't stop. Keep moving. It's the only way you'll get anywhere. In the end, you'll be hunched and achy from sitting too long and your mind will want to hurtle ever forward, not ready to relinquish its hard won inertia. Take a lap. It will take even more effort to realize when you arrive. You'll feel a mess, most likely. Wear the miles like a trophy. 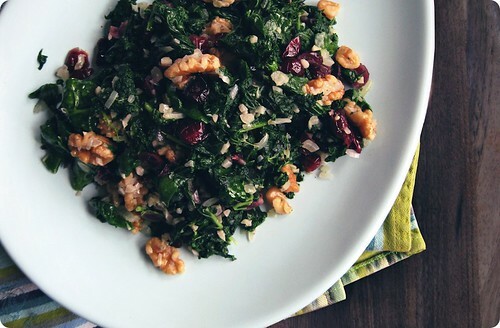 Recipe from Kristin Kish, as published in Food and Wine magazine, June 2013. These tea cakes were one of the recipes Kish came up with when challenged to create three simple desserts. The batter comes together in minutes, and is fairly straightforward; the only caveats are to make sure that the brown butter and toasted pistachios are cooled before proceeding. If the butter is too warm you might scramble the egg whites, and if the nuts are still hot when processed, they will turn to paste. The financiers are moist and toothsome, somehow suited better for being held between two fingers rather than eaten with a fork. They remind me of everything I like about a butter-rich coffee cake, and they are best used in very much the same manner. That is to say with tea or a glass of cold milk or a thermos of coffee. Good at home, they're happy travellers too, sturdy and packable. They don't require hullabaloo. I baked most of the batter in mini muffin tins as directed, and some in 1/3-cup tins. The latter were meant for a homecoming, and if you're in need of some fanciness, they were quite pretty after a roll in granulated sugar. The muffin-tinned version could also be given a similar treatment, as well. The sugar crusts the outside, giving gritty crunch to the soft density of the interior. The brown butter and the almond extract suit the pistachios for all their waxy greenness, emphasizing the nut's richness and fragrance respectively. Almond extract always tickles my nose. Kish suggests the financiers be served with whipped crème fraîche and fresh berries. I'll be trying that. We're not yet at berry season, but we're pointed in the right direction. Preheat the oven to 400°F. Butter and flour 36 mini muffin cups. In a saucepan, cook the 7 ounces of butter over moderate heat, shaking the pan, until the milk solids begin to brown, about 5 minutes. Scrape the butter and browned solids into a bowl and let cool. Whisk in the brown sugar, egg whites, granulated sugar and almond extract. In another bowl, whisk the pistachios with the 1 cup of all-purpose flour, the cake flour and the salt. Fold the dry ingredients into the brown butter mixture until combined. Spoon the batter into the muffin cups and bake for about 15 minutes, until risen but still slightly soft in the center. Let cool slightly, then invert onto a rack to cool. Serve the financiers with crème fraîche and berries. A heaped tablespoon is about what you need for each well of the mini muffin tin. I started checking my financiers at 12 minutes. I've got it in my head that these would be tasty with some vanilla bean in the batter, or crushed up cocoa nibs, but neither is necessary. Canadian Thanksgiving was two weeks ago. It landed perfectly, squarely, on the start of a week that was particularly fine. On that day, my father carved the roast bird, my brother made a mushroom gravy for which I immediately begged the recipe, the house was full, and despite some autumn coughs nagging little ones, it felt a grand affair. It felt like a herald. It felt like my favourite holiday of the year, which it is. The next day, in that funny routine of the morning after, I puttered about the kitchen considering a bout of dietetic austerity to balance out the (glorious) feast of the night before. Fueling these virtuous ideas in my tired mind were immodest handfuls of candied pecans. It wasn't even nine o'clock in the morning and I was crunching my way through a jar in the pantry like a crazed chipmunk. Temperance has never been one of my strong points. The nuts had been a late entry onto our celebratory menu. On a last-minute run to the market I'd decided additional provisions were required for guests to crunchily munch while we tasked ourselves with the preparation of the main event. I settled on pecan halves without a set inspiration; an unspecific thought of roasting and salting was about as far as I'd gone. 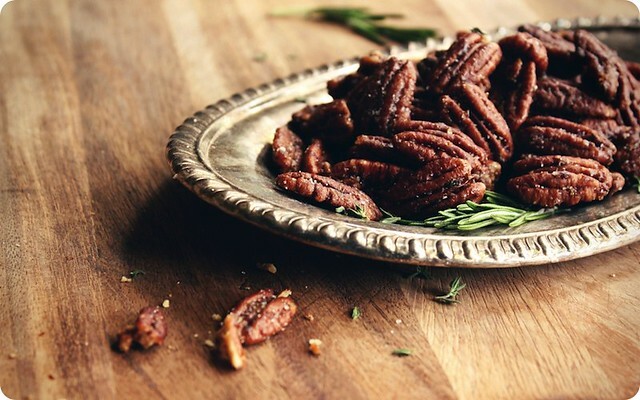 It was the abundance of herbs on the counter and a long-standing addiction that took the pecans further than that initial route - all the way to New York city, into a wardrobe of sugar and rosemary with the addition of thyme, and enough cayenne for some downtown sparkle. As an ensemble the combination hints at boskiness against an urban sensibility - a woolen dress paired with a bright red lip. Now my first go I should tell you, as seems habit with me, was not a unmitigated success. The seasoning was bang on but I'd rushed the baking - the coating was ever so slightly sticky. Thank goodness for my family, kind souls they are, nobody complained. Being ever the fusspot I felt that stickiness had to be addressed. After the plates were cleared and the house had emptied, the remaining nuts went back onto a sheet pan and into the oven. Five more minutes tacked on to the baking. This time, once cooled, they snapped. That's the trick for early autumn. The coat you wear won't be down or duffle, and the same is true for pecans on Thanksgiving. Their dressing was thin, a sheer, shining wrap, that caught, pleating and folding around the craggy profile of the nuts. Tailor-made garb for an October evening. Or an October morning as well, if we're keeping track. With inspiration from the spiced nuts served at the Union Square Café in New York City. It will look as though there too much glaze as the nuts go in the oven - don't fret. As they bake the syrup will thicken and gather around the pecans. By the time they're done pan will be almost dry. Preheat an oven to 375ºF (190ºC). Line a standard half sheet pan with parchment paper. In a small saucepan over medium heat, melt the butter with the maple syrup and Demerara. Once melted, remove from the heat and stir in the herbs, spices and salt. Toss the pecans with the butter mixture in a large bowl, making sure to coat well. Spread nuts in a single layer on the prepared pan. Bake in the preheated oven, turning occasionally, until the nuts are glazed and shiny with a deep golden colour, around 12 to 15 minutes. Upon removing from the oven, sprinkle lightly with fleur de sel if using and stir again. Cool completely, then store in an airtight container. Thanks to Sheri for inviting me to be a part of the "On This Fall Day" series over at The Stir. I am so happy to be part. You can read my entry here if you'd like! Most often an optimist, my moments of pessimism sometimes pay off. Last week, not even an hour after we talked about melting snow and bare earth, it snowed. I just knew that would happen. That night, we shoveled the driveway. Then, starting two days later, it snowed for three days straight. We cleared and shoveled often. We almost broke a shovel. With the romantic fancy of my burgeoning hope for spring, I'd be blameless in muttering a sailor's curse or three as I tromped up and down and back and forth across our driveway and up the garden path. Maybe it is the madness of midwinter, but I have, shockingly, embraced the snow. And shoveling. I really like the shoveling. I volunteer to shovel. Trippingly pulling my boots on, and with the words only halfway out of my mouth, I'm out the door. I try to wait until after dinner, so everyone's fed and happy; when the darkness has settled in and all the streetlights are on. In that quiet, the scene that greets me is especially beautiful. The languid wind of our street, the glow of porches lit in rows, a car rolling slowly past with its wheels crunching the snow the plows haven't cleared yet. Tethered to our house with the task of shoveling, it's a snow globe existence; a world contained by how far I can see around the bend of the road. There is a deep satisfaction in the feel of a blade cleaving through the weight of snowdrift, the metallic scratch of the shovel against the pavement. There is a thought of productivity and industry, a chest-puffing pride in getting a job done. And yet, moving back and forth across the drive, the pattern of my footsteps is simultaneously meditative. The imagined dome of my small world condenses my thoughts and clears out the rubbish. I come back inside, cheeks flushed and arms tired, my mind full of a hundred new ideas. I'm an odd duck, I know. But it makes me happy and I always sleep well after. Yes, I really do like shoveling. Not something I'd ever thought I'd say. And, while we're on the subject of likes, I really like cakes made with tangerines and almonds. It's a like I think you'll find easy to understand. I made this cake as an interpretation of Nigella Lawson's Clementine Cake from her book How to Eat, which as it happens is an interpretation of Claudia Roden's orange and almond cake. It's made without flour; at its most simple the recipe only requires fruit, nuts, eggs, sugar and baking powder. I've fussed up the cake because of the ingredients I had, and appreciated the effect of those additions. Neither version disappoints though, so either way you're set. It reminds me of marmalade, with the pith and peel used to their fullest. It is modestly sweet with a sourness you feel on your teeth. That devastating bitterness humming underneath the waxy fat of the ground nuts. The exterior bakes to a glossily sticky bronze, with a blond crumb underneath. The scent of almonds and citrus is remarkable, smelling as you'd imagine wintertime should. To eat this is to swallow the March sun, a beam of brightness on a snowy day. Or, if you're like me, it's just what you want when you come in from an evening of shovelling. Adapted from Nigella Lawson. I use skin-on, raw almonds for colour and texture. Blanched almonds or pre-ground meal can be used as well. Place the tangerines in a medium pot. Pour over the orange flower water if using, then fill the pot with cold water until the fruit is covered. Bring to a boil, then reduce the heat to maintain a simmer. Cook until the tangerines are quite tender, around 2 hours. Drain the fruit and set aside to cool. Over a large bowl to catch the juice, split each tangerine in half horizontally, and pick out any seeds. Put the flesh, peel and pith to the bowl, and discard the seeds. Preheat an oven to 375°F (190°C). Lightly butter an 8-inch springform pan, then line with parchment paper on the bottom and sides (with a collar of paper extending a little past the rim of the pan). In the bowl of a food processor with the blade attached, grind the almonds to a fairly even meal. Add the tangerines, and process to a thick purée. Bits of nut and tangerine skin will still be visible. In the large bowl used for the juices earlier, beat the eggs until blended but not frothy. Stir in the sugar and vanilla bean seeds, then the baking powder and salt. Fold in the fruit mixture. 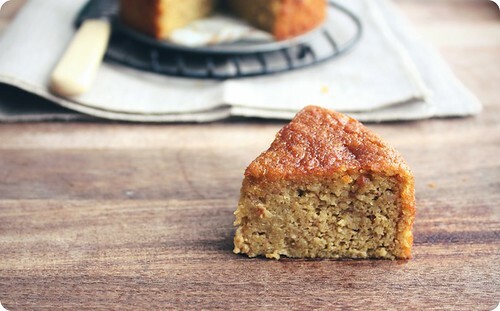 Pour batter into the prepared pan and bake in the preheated oven until a cake tester inserted in the centre of the cake comes out clean and the cake is pulling away from the sides of the pan, around 1 hour. If the cake is browning too quickly towards the end of baking, tent with foil. Remove from the oven and cool, still in its tin, on a wire rack. Makes one 8-inch cake that's even better after a day. 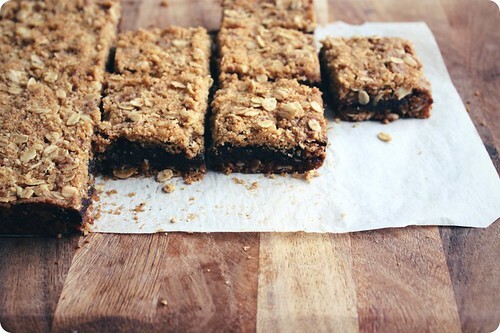 Date squares. Or do you call them bars? By whatever name, they were not a product of my childhood kitchen. My earliest association with these fruit-stuffed cookie sandwiches was elementary school bake sales, set up in the halls of our school for some charitable endeavour or another. Those were exciting times, when our milk money was augmented with a few extra coins from Mum so that my brother and I could purchase a treat of our own choosing. Of our own choosing! I remember being giddy at the thought of such power. Upon arrival at school, all eyes would grow wide as the exotic array of baked goods emerged from backpacks. The riches were transferred to the careful hands of parent volunteers who laid them out on long tables in the hall outside our classroom. I don't know how I kept myself from swooning at the sight. Nor do I know how we lasted through what surely seemed an interminable wait until lunchtime. A child of specific tastes, the exact moment the big hand and the little hand met at the top of the clock and that lunch bell rang, I'd make a beeline for the Rice Krispie treats. How do I love thee, you golden bricks of marshmallow-and-butter-bathed cereal. They were first-class sugar bombs, and a guilty favourite to this day. I vaguely recall date squares had their place on those tables, but they resided only on the edge of my awareness. Fast forward to yesterday, when I had in my possession a stash of Medjools. I'd bought some for the specific purpose of a sticky-toffee-pudding-inspired cake; but when the matter of the cake was taken care of, a few handfuls remained, succulent and sweet beneath their sugar-flaked skin. In consideration of my previous nonchalance, it was surprising choice that I set about knocking together a pan of date squares. The first date squares I've ever baked. I consulted various recipes, and took the best from the varied incarnations of date squares (bars?) I found. Some were with a shortbreadish base that had the butter and sugar creamed together before the introduction of the flour. A few had eggs involved, while most did not. There were oats and nuts to consider, and then there were dialogues in regards to the filling; sweeten or not to sweeten. Options galore. I decided my treasures should be left as they were, so I stewed the dates briefly, then processed them into a dense, gungy purée that squelched pleasingly when spooned. The kicker in the filling was the few specks of floral-sharp clementine zest, which light up the mellowness of the dates like sparklers in the night sky. It was a modest elaboration that made all the difference. The rest followed a simple method, you make the same sort of crisp topping I like for crumbles; cold butter is cut into a flour mixture to form irregular clumps, clumps which melt upon baking and crisp the surrounding dry ingredients into a rough and golden landscape. In this case the flour and oats are divided, with half patted into a tin to form the bottom crust. The dates slump in next, then the rest of the mixture is scattered over top. When baked, the date filling sinks and seeps into the lower crust, so that the line between the two is blurred and what is left perfectly-bound strata of oats and fruit. The topping is not invited to their party and so turns sandy and delicate, crunchy only here and there. The perfect offset to the heft that lies beneath. From the oven, the pan must rest, first on the counter and then in the fridge. The butter, and there is a good deal of butter here, firms up just enough to give it all some additional structure and the layers get a chance to settle into each other. All that's left is to cut the pan into bars (squares?) before you take a piece in one hand, a cold glass of milk in the other, and feel rather smug about your handiwork. There is something to be said for the act of slicing a tray of cookies that gives such a gratifying feeling of provision - a few swift swipes of the blade and you can feed a household for days. Happily. Handily. I do not know what I was expecting with that first bite, but I surely wasn't expecting this. The skimpy serving of spices I had granted the crust had made their presence known in the most wonderful way; the squares were perfumed with the dark, deep notes of the wintry spices, and tasted of everything homespun and old-fashioned. And I liked it very much. Now if by some rift in the space-time continuum third-grade me happens to be reading this, please take my advice and maybe give date squares a chance. And while we're at it, let me tell you now that our brief, torrid dalliance with crimped hair in the fifth grade is not a good idea. I don't care if all your friends own crimping irons, it's not a good look for them either. Heed my words, younger me, you'll understand when you're older. And save your pennies for the next bake sale. Adapted from a variety of sources. I used some clementine to flavour the filling, but a few grates of orange zest would be just as good. Preheat the oven to 350°F (175°C). Grease and line an 9-inch square pan with parchment paper so that the paper hangs over the sides of the pan. In a small saucepan, pour the water over the dates. Bring to a boil over medium high heat, stirring often. Reduce the heat to medium low to maintain a simmer, cooking the fruit until all of the liquid has been absorbed and the dates become a soft, concentrated paste, around 10 minutes. Stir often. Set the fruit aside to cool, stir in the clementine zest. Once the dates are cool, purée them in a food processor fitted with the metal blade attachment. Scrape out the dates to a bowl as best as you can, but don't worry if there's a bit left behind. Set the fruit aside. Into the processor, add in the nuts, flours, salt, baking soda and spices. Pulse to combine. Add the sugar and pulse again. Using your fingers to keep the pieces separated, crumble in the butter into the dry ingredients. Pulse again a few times until the flour and butter mixture resembles a coarse, uneven meal. Pour the mixture into a large bowl and stir in the oats. Press a generous half of the crust mixture into the prepared pan. Spoon the date filling over, spreading it to cover the crust completely. Sprinkle the rest of the crust mixture over the fruit. Bake in the preheated oven until the top crust is golden brown and crisp, around 30 minutes. Rotate the pan once during baking. Cool the bars completely on a rack, still in the pan. Once at room temperature, chill in the refrigerator for 30 minutes to firm up. Slice as desired, serving them at room temperature or chilled. Makes one 9-inch square pan, can be stored in an airtight container at room temperature or refrigerated (my preference). • You can choose the nuts to use here. I went with walnuts (robust), but pecans (buttery) and almonds (fragrant) are also good candidates. In the case of nut allergies (hi Hannah! ), use an additional 1/2 cup of either of the flours. • The kosher salt remains noticeable in the crust; if you prefer a less discernible result, use a finer-grained salt and possibly use less. • I am tempted to try these again with 3/4 cup brown sugar and 1 1/4 cup of oats, but my family has said that they should be as they are. Just thought I'd mention. There is that saying about loving something enough to give it away, and if it comes back then it was meant to be. I'm wondering if that applies to cakes, too. Specifically a Cinnamon Walnut Mud Cake. I made this cake for a birthday celebration I was unable to attend. It was packed up with not even a crumb missing; an exercise in willpower and an act of true affection. 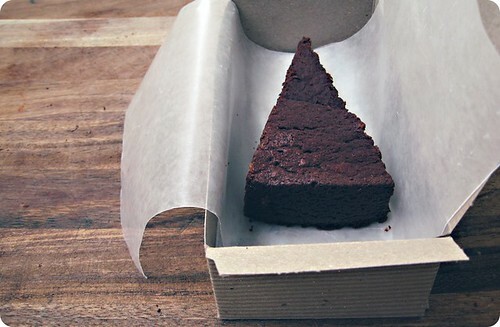 The next day a generous slice was brought back to me, with thanks, so that I could share in the festivities. I took this as a sign that not only was this cake meant to be mine, but it was also meant to be one I told you all about. My friends, this cake deserves the chatter. As straightforward as they come in method, it is a melt-n-mix affair that was just right for a midweek birthday. Despite its brooding looks, the cake is has a surprising delicacy. A fudgy underside is layered with a cracked and crumbly, mousse-like top, with airy texture that immediately melts upon contact with the tongue. Bouncy for all of its darkness, like damp, rich soil that's made of chocolate and sugar instead of, well, dirt. Walnuts break up the crumb like supple pebbles. I sent this cake out into the world with little expectation, and it returned as a gift for me. And while a selfish little voice my be murmuring somewhere in the corners of my mind, it is a gift I am happy to share. Grab a fork and dive in. The box in the photo was made by simplesong designs, and is one of Suann's wonderful letterpresssed creations. Her store is full of treasures like these pencils, and her blog is a perfectly-curated collection of things that have caught her fancy, as well as her own beautiful projects (be sure to check out the adorable invitations to her son's birthday and the dinner party she recently threw for charity - it's stunning). She's just fab. And to all my Canadian friends, Happy Thanksgiving! Those who appreciate the depth of chocolate might want to substitute 4 ounces of bittersweet for the same quantity of semisweet here. Lightly butter a 10-inch springform pan then line the bottom with a disc of parchment paper. Use strips to line to line the sides, pressing the parchment into the butter to adhere. Sift or whisk together the flour, baking powder, cinnamon and salt in a small bowl. Set aside. In a saucepan over medium heat, melt the 8 ounces of butter with the chocolate, stirring until smooth. Remove from the heat to cool slightly. In a medium bowl, whisk together the eggs, sugar and vanilla. You do not need to blend them together terribly vigorously, just enough so that the sugar is dissolved. The mixture should barely lighten in colour and there will be a layer of bubbles at the surface but not throughout. Pour the egg mixture into the chocolate, and stir to combine. Fold in the flour mixture, being careful not to overmix. Stir in the walnuts. Pour the batter into the prepared pan and bake in a preheated oven for 35-40 minutes, or until the centre is puffed and cracked. A cake tester inserted into one of these cracks should come out with wet, clumped crumbs; gooey but not liquid. The cake will continue to cook as it cools, losing its crown and falling back upon itself. Remove the cake to a wire rack to come to room temperature. To serve, release the sides of the springform carefully and remove the parchment paper. Dust the top with cocoa powder pushed through a sieve. Makes one 10-inch cake, serving 16. • If I am being honest, even though I have directed to sieve together the dry ingredients in the recipe, I may have simply dumped those dry ingredients onto the wet without adverse effect. Shh. Don't tell. • This cake likes to be handled with care. 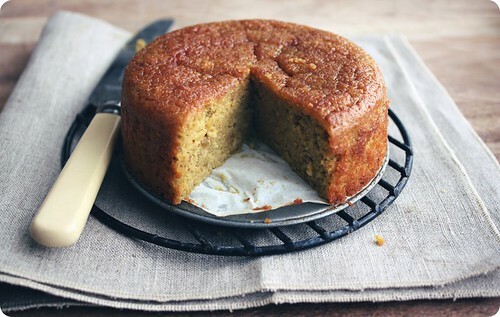 For ease of serving, chill the fully-cooled cake for around 30 minutes before slicing and it will firm up. It can be stored at room temperature for a day or two, but I prefer to keep it covered in the fridge. • A spoonful of sweetened sour cream makes an ideal accompaniment. I failed. F-a-i-l-e-d. It was epic. Had you walked into my kitchen in the late-afternoon hours of Wednesday, September 16, 2009, you would have found me covered from hand-to-elbow with dough and in near exasperated tears, with every viable work surface buried under the detritus of my humiliation, my father at my side in a valiant effort to salvage the day, my husband on the phone patiently talking me down from my fit of pique and, in calm, even tones, assuring me that takeout would be more than fine for dinner. I tell you, I can make gnocchi. Honestly. While not regularly enough to say often, I've made it enough times to consider myself passably adept. But this, this was a new, devil of a recipe. A recipe that wanted to take me down. And boy, did it ever. It went straight for the knees, pinned me to the mat and had me calling for Daddy. I won't go into too many details or point any flour-encrusted fingers, since I'm not entirely sure that the fault is that of the recipe or my own. Or a combination of the two. The blame may lie with the potatoes. Who knows. I will tell you that the dough refused to come together in any semblance of a workable substance. I had a languid blob lounging smugly on my kitchen counter. No matter how much flour I fed it it would not be sated; it was still boundless, still a slowly-oozing, formless mass. That's when I called in reinforcements. We rallied, we prevailed. Somewhat. My father and I managed a handful of successful dumplings, those few sent into the boiling water, then tossed with softened butter and a handfuls of Parmesan. Optimistically, we each tried one. It was a joyless mouthful. They tasted of defeat. Defeat and cheese. So abject was I, I was tempted board up the kitchen and declare it all a lost cause. If it weren't for the Fig and Walnut Bread we had made earlier in the day, I might have scrapped any tattered remnants of faith I had in my culinary ability. The bread was a riff on Julia Child's white bread that we make quite often, a fruit-filled version based on a combination of flavours I have done before. Enriched with milk and fragrant with honey, the sturdy crumb is the ideal sort to be wrapped around a swirl of dried figs, walnuts and the subtle, savoury presence of thyme. It is a bread to be cut into thick slices, toasted enough that you hear the fruit sizzle ever so slightly, slathered with sweet butter in lavish proportion and then munched, gleefully. And we did exactly that, while we waited for the delivery man. Adapted from Julia Child's Homemade White Bread. More than just saving my pride, the bread saved today - if it wasn't for the bread, I'd be here empty handed. And I hate to do that. So while this may have not been my intended offering, please accept it, with the admission that since this was an unplanned debut, I did not take notes as conscientiously as my usual. But we are all good enough friends that I hope that my best guess will suffice for now. The loaf in question is already a thing of the past, and there has been another petitioned for the weekend; I will retry the recipe then, to double-check my recollection. Saturday, September 19, 2009: I tested the recipe again last night, and made two changes - both pertaining to butter. I added the 2 tablespoons of butter to the milk/water mixture to reduce the number of steps, with no ill effects to the final bread. Surprisingly, I also decided it is better to forgo the smear of butter in the swirl since the fat causes the layers to separate, leading to loss of filling when the bread is sliced. Without the butter the dough gripped the figs and walnuts more firmly. In a medium skillet over medium heat, toast the walnuts for about 5 minutes, stirring often. Once the nuts are lightly-golden and fragrant remove immediately from the heat and into a bowl. Toss through with a sprinkling of fine sea salt, if using, and the chopped thyme. Set aside to cool. In a small saucepan over medium-low heat, gently warm the water and milk. Add the honey, stirring to dissolve. Stir in the butter, heating gently until melted. The mixture should be warm, around 105-110°F. Pour liquids into the bowl of a stand mixer or a large bowl. Stir in the yeast and allow to stand for five minutes. To the yeast, add 3 cups of the flour and the salt. With the dough hook attachment or by hand, mix to combine (if using a mixer, proceed on medium speed). Continuing to stir, add the remaining flour a little at a time, until the dough begins to pull away cleanly from the sides of the bowl; it should still be slightly sticky. Turn the dough out onto a lightly-floured work surface and knead until smooth and elastic. The amount of time will depend on if you used a mixer or worked by hand, anywhere from 2-10 minutes. Place the dough in a large, lightly-greased bowl, turning the dough over to coat. Turn the dough right side up and cover loosely with plastic wrap or a tea towel. Set bowl in a warm, draft-free spot to rise until doubled in bulk, around 2 hours. Butter two 8-by-4-inch loaf pans and set aside. Punch the dough down gently, then divide into two equal portions on a lightly-floured work surface. Taking one ball, roll out to a rectangle around 9-by-12-inches. Sprinkle half the sugar over the dough, leaving a thin border at all sides. Repeat with half of the figs and half of the toasted walnuts. Start rolling the dough from the short end, forming a tight cylinder, pinching the seam together to seal. Bring just the edge of the ends of the roll up to enclose the sides and pinch to seal. Place the dough into one of the prepared pans. Repeat process with the second ball of dough. Cover loaves loosely with plastic wrap or with tea towels, and allow to rise in a warm spot until doubled again in bulk, around 45-60 minutes. Preheat an oven to 375°F (190°C). Brush the loaves with the remaining melted butter, and bake in the preheated oven for 35-40 minutes. The bread is done when it is golden brown and sounds hollow when tapped from the bottom. Turn loaves out immediately onto a rack, turning them right side up to cool. • It is best to use a mild honey here, nothing with so much presence that it overshadows the mellow sweetness of the figs. • Raisins, dates or dried cranberries would all be good substitutes for the figs, and resh rosemary for the thyme. • For a straightforwardly-sweet filling replace the thyme with a generous sprinkling of cinnamon. Feel free to be generous with the muscovado as well. • I scatter the figs and walnuts somewhat erratically; I think the uneven distribution results in a more interesting loaf. If you want a perfect coil of filling, be more precise. • Zoë has a helpful photographic step-by-step of how to roll such breads on her (lovely, inspiring) site. Any of the doughs she mentions would be a fine match for this filling.